Successfully Added Centurion Biometric Fingerprint Access Entry System to your Shopping Cart. Biometric fingerprint security door lock for your office, business or home. This is the highest grade of factory-direct fingerprint access entry system on the market today! The Centurion Fingerprint Access Entry System and Door Lock is what all forms of door security are measured from. 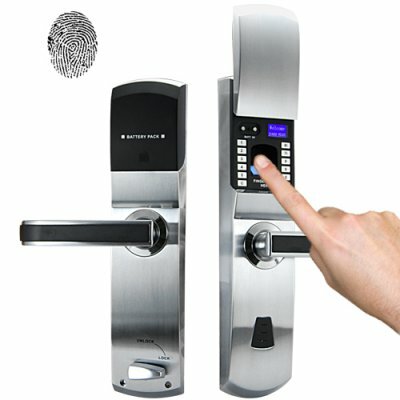 Built rock-solid with a heavy gauge all-metal locking system and the best biometric fingerprint measuring and analyzing chipset on the market today, this is THE SECURITY PRODUCT for companies and individuals who want the ultimate in controllable entry security. If you want the ultimate in security + convenience, then The Centurion provides you with exactly what you need. A Fingerprint Door Access Security System is the best and most secure method in assuring only authorized people can access certain buildings or rooms in your company, university campus, hotel, or even home. You can set it up to use a finger, use a code, or both. If you have a room or building with information, samples or materials that only authorized personnel should handle, then a Biometric Fingerprint Access Entry System is your best choice for the security and safety of your data and materials. What you get with this fingerprint door lock is complete peace of mind with a guarantee of 21st century security, meaning this lock cannot be picked or bypassed. If you fire or dismiss an employee, there is no worry or headache about getting the office keys back (and worrying if they made copies). You simply remove his/her profile from the door systems registry and no he can no longer open the door! If someone is not authorized to have access, then they will never be able to open the door - it's as simple as that! In addition to total security, this superb Biometric Fingerprint Access Entry System comes with an unbeatable factory direct wholesale price, meaning you get a great value and an amazing fingerprint door lock and entry system. Don't wait, it's in stock in our warehouse right now, so click "add to cart" to get yours today! Does the CVKR-BG05 fingerprint lock have a low battery alert? Yes. When you slide the cover up and hear a triple BiBiBi sound instead of the normal one Bi sound, then the battery is low. It is recommended to change the batteries immediately when there is low battery alert because once the battery dies you can only open the door with the keys. By using the a pin or the included pin you can remove the cover. No, The CVKR-BG05 is weather proof. Meaning any moist build up from fog or frost should be fine. It is not advised to install the CVKR-BG05 in un-sheltered areas where direct contact with rain, hail, or snow is likely.